The party of Colombia’s President Ivan Duque has retracted its support for an anti-corruption referendum set to be held in two weeks, former President Alvaro Uribe said Wednesday. After supporting the initiative ahead of the elections in June, Uribe announced his change of mind after he was caught on video rejecting the initiative to curb corruption. In the first sitting of Congress since Duque took office, Uribe said that he has changed his mind over the anti-corruption project after the elections on claims this initiative should come from Congress and not the general public. Congress is widely considered Colombia’s most corrupt institution, according to pollsters. The anti-corruption referendum will ask Colombian citizens to approve seven measures which would help curtail their notoriously corrupt congressmen. Among the measures are a proposed salary reduction for members of congress, citizen participation in budget debates, and increased transparency in campaign financing and the rewarding of government contracts. Further proposals seek to limit the number of terms a lawmaker can serve to three and the publication and confiscation of illegal income of legislators. As recently as April this year, Uribe publicly backed the proposals which were driven by former Senator Claudia Lopez of the Green Alliance. The former president and current leader of the hard-right Democratic Center party was embarrassed earlier this week after the release of a video in which the ex-president privately contradicted his public stance. 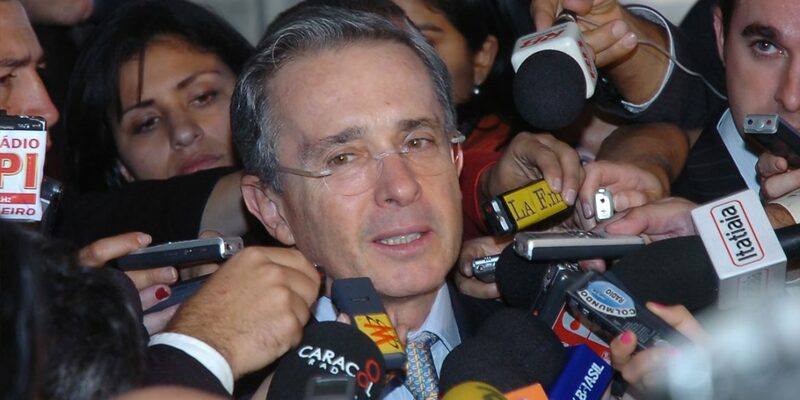 In the footage, Uribe can be heard expressing his desire that newly elected president Ivan Duque not support the referendum. Duque, who spent his first official day as president on the island of San Andres, stated that he will respect the referendum but also claimed that his government will present a comprehensive anti-corruption package. According to Uribe, civilians should support the their government rather than Lopez’ initiative to curb corruption. The former president has been embroiled in numerous corruption and war crime scandals, but continues to be one of the most powerful men in Colombian politics.